VATICAN CITY (CNS) — Christian faith is belief in the concrete work of God and leads to concrete witness and action by believers, Pope Francis said. 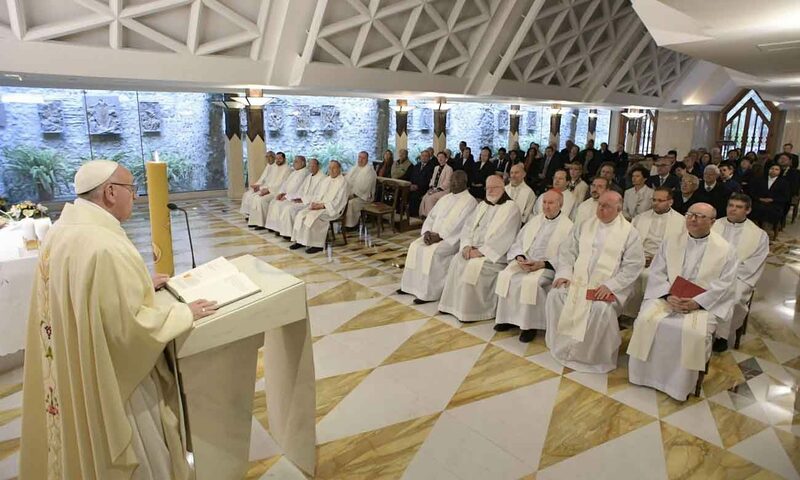 The Christian creed details concrete events because “the Word was made flesh, it was not made an idea,” the pope said April 24 during his morning Mass in the chapel of Domus Sanctae Marthae. “The creed does not say, ‘I believe I must do this, that I must do that’ or that ‘things are made for this reason.’ No! They are concrete things,” such as belief in God who made heaven and earth or believe in Jesus who was born of Mary, was crucified, died and was buried, the pope noted. The concreteness of faith “leads to frankness, to giving witness to the point of martyrdom; it is against compromises or the idealization of faith,” he said. Pope Francis reflected on the day’s first reading from the Acts of the Apostles, which recalled Peter and John’s release after they were imprisoned by the Sanhedrin following the miraculous healing of a cripple. The “rationalistic mentality” shown by the Sanhedrin, the pope added, did not end with them, and even the church at times has fallen into the same way of thinking. “The church itself, which condemned rationalism, the Enlightenment, many times fell into a theology of ‘you can do this and you can’t do that,'” forgetting the freedom that comes from the Holy Spirit and gives believers the gift of frankness and of proclaiming that Jesus is Lord, the pope said. “May the Lord give us all this Easter spirit of following the path of the Spirit without compromise, without rigidity, with the freedom to proclaim Jesus Christ as he came: in the flesh,” Pope Francis said.